Born on March 23, 1912, in Wirsitz, Germany, Wernher von Braun's father, Baron Magnus von Braun, was a founder of the German Savings Bank, a member of the Weimar Republic Cabinet, and minister of agriculture. His mother, the former Emmy von Quistorp, a musician and amateur astronomer (one who studies the universe), was a strong influence on her son, especially after she gave her son a telescope as a present. Wernher spent his childhood in several German cities, as the family moved wherever Magnus was transferred. At the French Gymnasium, Wernher excelled in languages but failed physics and mathematics. He then attended the Hermann Lietz School at Ettersburg Castle, where he developed an intense interest in astronomy and overcame his failures in other subjects. Fascination with the theories of space flight then prompted him to study mathematics and physics with renewed interest. Before he graduated, he was teaching mathematics and tutoring other students. 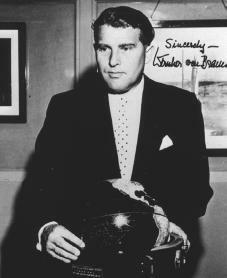 Von Braun enrolled in the Charlottenburg Institute of Technology in Berlin. He became an active member of the Verein für Raumschiffahrt (VfR; Society for Space Travel) and an associate of Hermann Oberth (1894–1989), Willy Ley (1906–1969), and other leading German rocket enthusiasts. In 1930 Oberth and von Braun developed a small rocket engine, which was a technical success. Adolf Hitler (1889–1945) rose to power and became chancellor (leader) of Germany on January 30, 1933. Still upset about the restrictions of the Treaty of Versailles that ended World War I (1914–18), the German army looked to rebuild its forces. The treaty severely restricted Germany's production of weapons, such as guns and cannons. But the treaty made no mention of rockets, and German military planners hoped to develop rockets as weapons. They immediately turned to von Braun. When World War II (1939–45) began, Germany gave rocket development highest priority. While von Braun developed a large rocket named the V-2, the Nazis (Hitler's army) wanted it as a weapon of war. Von Braun had a different vision: space travel. By 1943 von Braun's rocket complex was the primary target of the Allied forces (America, France, and Great Britain). When Germany was near collapse, von Braun evacuated his staff to an area where the Americans might capture them. He reasoned that the United States was the nation most likely to use his resources for space exploration. The rocket team, which consisted of more than five thousand coworkers and their families, surrendered to U.S. forces on May 2, 1945. During questioning by Allied officers, von Braun prepared a report on rocket development and applications in which he predicted trips to the moon, orbiting satellites, and space stations. Recognizing the potential of von Braun's work, the U.S. Army authorized the transfer of von Braun, 112 of his engineers and scientists, 100 V-2 rockets, and the rocket technical data to the United States. and his cousin, Maria von Quistorp. In early 1947 he obtained permission to return to Germany to marry Maria. They had three children. On April 15, 1955, von Braun and forty of his associates became naturalized citizens. The Russian space program outpaced that of the United States in the 1950s. When the Russians successfully put Sputnik I into space and the U.S. Navy's Vanguard program failed, the United States turned to von Braun's group. Within ninety days, on January 31, 1958, the team launched the free world's first satellite, Explorer Ion, into orbit. After the creation of the National Aeronautics and Space Administration (NASA), von Braun was appointed director of the George C. Marshall Space Flight Center at Huntsville, Alabama, on July 1, 1960. The space agency sought his advice about techniques later used in landing on the moon. Just before Christmas, 1968, a Saturn V launch vehicle, developed under von Braun's direction, launched Apollo 8, the world's first spacecraft to travel to the moon. In March 1970 NASA transferred von Braun to its headquarters in Washington, D.C., where he became deputy associate administrator. Von Braun resigned from NASA in July 1972 to become vice president for engineering and development with Fairchild Industries of Germantown, Maryland. Besides his work for that aerospace firm, he continued his efforts to promote human space flight, helping to found the National Space Institute in 1975 and serving as its first president. On June 16, 1977, he died of cancer at a hospital in Alexandria, Virginia. Bergaust, Erik. Wernher von Braun: The Authoritative and Definitive Biographical Profile of the Father of Modern Space Flight. Washington, DC: National Space Institute, 1976. Lampton, Christopher. Wernher von Braun. New York: Watts, 1988. Piszkiewicz, Dennis. Wernher von Braun: The Man Who Sold the Moon. Westport, CT: Praeger, 1998. Stuhlinger, Ernst, and Frederick I. Ordway III. Wernher von Braun, Crusader for Space: An Illustrated Memoir. Malabar, FL: Krieger, 1994.